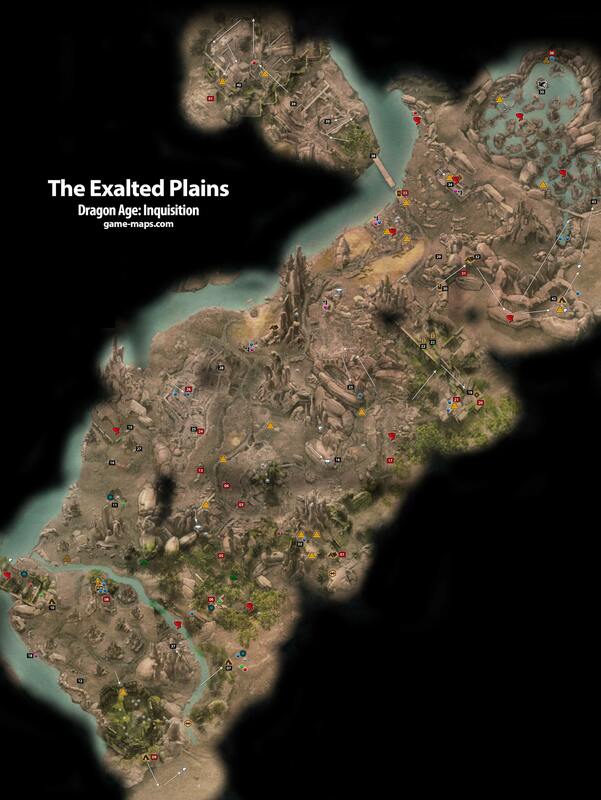 The Exalted Plains - Dragon Age: Inquisition Walkthrough, Game Guide and Maps, with Quest and Locations of Camps, Merchants, Rifts, Ocularums, Astrarium, Dungeon Entrences, Landmark (POIs), Crafting Station, Mosaic Piece, Inquisition Agent, Secrets, Party Members, Bottle of Thedas and Codex Entry. IT IS APPROPRIATE THAT WE PICK THE EXALTED PLAINS AS OUR FIELD OF BATTLE. IT WAS HERE, CENTURIES AGO, THAT THE DALISH KINGDOM MET ITS BITTER END. THE HOLDOUTS OF THE ELVEN ARMY MAKING THEIR LAST STAND, REFUSING TO SURRENDER, AGAINST THE CHAMPIONS OF ANDRASTEZ THE TEMPLAR, THE SISTER, AND THE NOBLEMAN PATRON. THE CHAMPIONS CAUSE WAS JUST, AND THEIR FAITH LED THEM TO VICTORY. THE PLAINS WERE HENCEFORTH CALLED "EXALTED." SOMEONE ONCE SAID THAT THESE FIELDS ARE CHARACTERIZED BY EQUAL MEASURES OF BEAUTY AND STRIFE. THIS DESCRIPTION WILL HOLD TRUE FOR THE FORESEEABLE FUTURE. THE STRIFE WE BRING TO THE DALES WILL BE QUICKLY FORGOTTEN, HOWEVER, IF WE FIGHT HARD AND FIGHT WELL AND EARN A DEFINITIVE VICTORY. LET THE KNOWLEDGE THAT YOU STRIKE IN THE NAME OF THE TRUE EMPEROR ENCOURAGE AND GUIDE YOU. TRUTH AND RIGHTEOUSNESS PREVAILED ON THE PLAINS, LONG AGO. MAKER WILLING, IT WILL AGAIN. QUEST: A Well-Stocked Camp Put supplies in chest near Nissa. Check Ledger near Nissa for next assignment. Every time they will need another stuff, and every time you will gain some Dalish Favor. To finish this quest you will need: Three Great Bears Pelts - Great Bears can be found on Emerald Graves. QUEST: The Spoils of Desecration You need to find 3 Key Pieces in tombs around. When you got all 4 Glyphs, return to War Table and select Operation Investigate the Elven Glyphs. It opens Lost Temple of Dirthamen Dungeon. NPC: Golden Halla for The Golden Halla Quest. If you got this quest just follow it (on horse) to Dalish Camp (08). "Halfway between marker 29 and the closest landmark is a small pile of refuse, it looks similar to the bait used on the luring the abyssal high dragon quest in WA. if you loot the refuse pile you gain the recipe "Sad Splinters" it will take three of them to make so might want to save all the ones you get from storming keeps (breaking down the gates)." Bottle of Thedas in in Rift room. QUEST: Map of Halin'sulahn Spot marked on map is in (37). When you pass the bridge, you will meet "Walking Dead" mob. 42 Entrance to The Dead Hand Dungeon. One Mosaic Piece in on surface level, second is underground.